Does anyone know the history of control shortcuts? I saw an ad for a control +P print driver for the Sorcerer in a September 1980 magazine, so it must have been around on other systems. Is this a CP/M command? Wikipedia has an article referring back to teletypewriters and the use of the Control keys. I saw that entry, but I was hoping for some form of definitive timeline. Perhaps I misunderstood your question. I was thinking in terms of when did the Control key appear at all and what was it used for (cursor movement, bell, flow control etc), though perhaps you're really thinking of what the Wikipedia article mentions at the end, that computer programs eventually appropriated the Control key for shortcuts of more complex commands, and when that began to happen. At MIT, TECO development continued in the fall of 1971. Carl Mikkelsen had implemented a real-time edit mode loosely based on the TECO-6 graphic console commands, but working with the newly installed Datapoint-3300 CRT text displays. The TECO buffer implementation, however, was terribly inefficient for processing single character insert or delete functions — editing consumed 100% of the PDP-10. With Richard Greenblatt's support, in summer of 1972 Carl reimplemented the TECO buffer storage and reformed the macros as native PDP-10 code. As entering the real-time mode was by typing cntl+R, this was known as control-R mode. At the same time, Rici Liknaitski added input-time macros (cntl+]), which operated as the command string was read rather than when executed. Read-time macros made the TECO auxiliary text buffers, called Q-registers, more useful. Carl expanded the Q-register name space. With read-time macros, a large Q-register name space, and efficient buffer operations, the stage was set for binding each key to a macro. These edit macros evolved into Emacs. I wouldn't claim this was the first case of control key appropriation, though 1972 further predates CP/M at the very least. Let's research this backwards in time even more! Prior to the Mac, I would think that most terminal-based shortcuts were system-specific, not common across platforms. Dunno, the shortcuts defined by WordStar (1978) became quite popular in other programs and environments too, though it is true that the shortcuts used on the Macintosh eventually won over WordStar. I remember when ctrl-c would cancel your program/command execution. Was that not common among systems. Edited by mr_me, Fri Feb 8, 2019 12:59 PM. control+C is Copy for me since 1984. I think I would just whale on the BREAK button on the old mainframe. "On teletypewriters and early keyboards, holding down the Control key while pressing another key zeroed the leftmost two bits of the seven bits in the generated ASCII character." I read somewhere else on Wikipedia that the IBM PC keyboard layout came from the Selectric typewriter layout. That would explain the change in the placement of characters like, "@ & ^ _ + * ( ) ". Yes, many computers with various BASIC dialects support Ctrl + C to break into the program, though not all of them do. I should explain that my original question was triggered by some debate I read about the attribution of the keyboard shortcut. Some (how many?) coders apparently wanted the CTRL + P command to be a shortcut for "paste" instead of the "print" command to which it eventually became affixed. That Sorcerer ad from 1980 made me very curious as to when these commands were adopted and, even more interestingly, standardized -- and on what operating systems -- because, if it was being sold on the Exidy, it must have been seen as a desirable option and there must have been some market demand. But what was using this? And how widespread was its use on computers in the late '70s? I understand that PC DOS 1.0 incorporated at least some features from CP/M (2.1) and can only guess that control commands were part of its structure, too. All I know is that the bottom left corner of the QWERTY keyboard is the business district of Undo, Cut, Copy, and Paste (Z, X, C, V) for me. We should ask some older people. 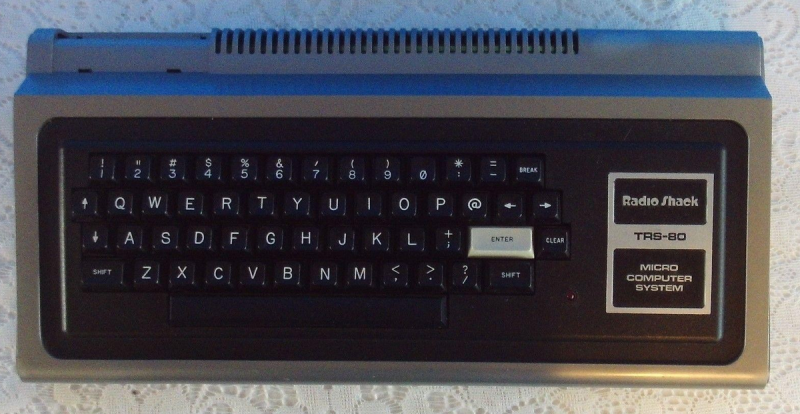 Like carlsson said, wordstar, which goes back to the 1970s had tons of control key commands including ctrl-kp for print, ctrl-kc for copy block, ctrl-kv for move block. In old wordperfect ctrl-p opened page setup. Ms-dos had a few control key commands, not sure if it had ctrl-p. Printing the screen was ctrl-PrintScrn in ms-dos. In cp/m ctrl-p toggled the printer echo feature on/off. In unix, ctrl-p retrieved the last command. Edited by mr_me, Fri Feb 8, 2019 4:33 PM. No, old wordperfect didn't have a ctrl-p. That would have been new wordperfect. I remember the 1980s was an interesting time with software. Every program had radically different user interfaces and I looked forward to seeing new ones. I kind of liked the lotus 123 interface. Furthermore, I wonder if the use of the Control key to obtain functions can be linked to the function keys which date back to 1965. While not directly related, I would imagine that the fewer dedicated function keys you had, the more desired it would be to bind the Control key to various functions.